"These children with disabilities are not a burden; they're a priceless gift to all of us. They're a doorway to the real meaning of our humanity." Everything is beauty. Everything is grace. I have often thought about the contradiction that children like Jack represent in our society. On one hand, the Culture of Death teaches that Jack's life is not worth living; that ending his life in the very beginning is the only 'humane' thing to do. That every foreseeable suffering for both mother and baby should be avoided, even if that means ending a person's life. After all, it's "for their own good". And on the other hand, nobody can dispute the fact that he is adorable, beautiful and perfect. My heart melts every time I see him. He was adorable, beautiful and perfect before he was born too - it just wasn't as apparent. 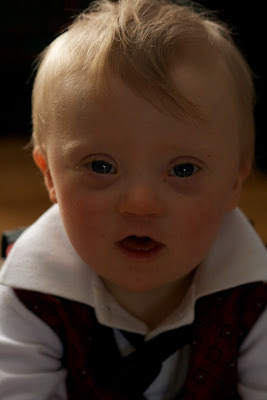 March 21, 2012 is the UN Sponsored World Down Syndrome Day. It's a day sponsored by many organizations including The National Down Syndrome Society, the National Down Syndrome Centre, Special Olympics and many others to raise awareness, change societal attitudes, promote inclusion and to fight for the rights of persons with disabilities. So in honour of World Down Syndrome Day and my nephew Jack-a-boo, I leave you with this clip. It touches my heart and soul every time I watch it. This is a small french community called Fraternites Notre-Dame de l'Etoile who strive to "support small fraternities of Down Syndrome people who want to live a spiritually oriented Christian life". Here's a moment of beauty and grace. Oh my, that was truly beautiful. Thank you for posting about your family, and also this incredible video! Thanks Mrs. P! I think I cry every time I watch it.